A painting of Davy Crockett waving farewell, carrying his long rifle and accompanied by his hunting hounds. Although most people think of Crockett as a great woodsman, he was also an important political leader during the 1820s and 1830s. D AVY C ROCKETT territories, not in being good neighbors to the people who had lived there for centuries. But did Davy really kill a bear when he was just three years old? Did he “grin down” savage animals, armed only with his strong grip and irresistible charm? 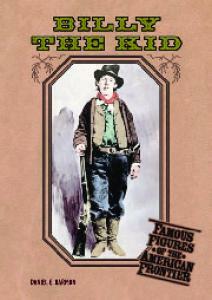 Did he never fail to hit the bulls-eye with “Ol’ Betsy,” his long rifle? Battle swamp ’gators? Teach a pet bear named “Death Hug” to smoke a pipe? Catch and wrestle a panther that had stolen his belongings? Not likely. He became forever famous for such feats, though. And there may even have been a grain of truth at the heart of some of the fantastic stories that have been told about him. Davy’s ancestors were Irish immigrants who arrived in North Carolina before the American Revolution. His grandfather, David Crockett, moved into the frontier in the 1770s, settling in eastern Tennessee, where he and his wife were killed by warring Indians. John and Rebecca Crockett, Davy’s parents, built a farm on Big Limestone Creek in Greene County. Davy was born there on August 17, 1786. Large families were common in America’s early years; Davy had eight brothers and sisters. This .58-caliber long rifle may have belonged to Davy Crockett; it was found in the ruins of the Alamo. Although muzzle-loading rifles of the early 19th century could be very inaccurate, Davy was renowned as a crack shot. He was said to be able to shoot the wick off a candle at 300 feet, and once killed 47 bears in a single month. In part, Davy learned his hunting skills through trial and error—and near tragedy. Once as a child, he fired his father’s musket at what he thought was a deer moving through the brush. The musket ball found its mark—but to Davy’s horror, it was no deer. It was a neighbor, picking berries in the forest. The man, shot through the lungs, lay feverishly near death for a long time, but to Davy’s great relief, he survived. When Davy was 13, his father insisted he go to school. D AVY C ROCKETT place to stay as a farmhand. The lad was a hard worker and was thrifty with his meager earnings. He soon saved $7—a noteworthy sum 200 years ago. If he kept at his work, in a few years he might be able to buy his own farm or start a small business. An unbridled spirit of adventure had already captivated the youth, though. At the moment, what he really wanted to do was see the ocean, perhaps even go to sea as a cabin boy. He went to Baltimore, one of the young nation’s most important ports. As things turned out, Davy never sailed the ocean. For about two years, he worked at various shore jobs. At last, in 1802, his yearning to see his family overcame his desire for independence—for the time being, at least. He made the long trip through Maryland and Virginia back to Crockett’s Tavern. He arrived late one evening. His family did not even recognize him because he’d grown so much. He said little, watching his relatives serve their wagoner guests and waiting to see if any of them would realize who he was. Finally, as everyone sat at the big table for supper, one of his sisters came around to him, overjoyed with amazement, and gave him a great hug. B OY OF THE WOODS Davy was angry at himself. “The joy of my sisters and my mother, and, indeed, of all the family, was such, that it humbled me, and made me sorry that I hadn’t submitted to a hundred whippings, sooner than cause so much affliction as they had suffered on my account,” he later wrote. His father and mother were no longer angry at him. In fact, his father had gotten into serious debt and desperately needed Davy’s help. The sturdy son dutifully went to work for nearby farmers until he earned enough to pay off John Crockett’s heavy bills. As a young man, Davy Crockett lived in this cabin in Tennessee. As the frontier moved west over the years, Crockett would continue to move with it. man. His quick humor and gift for telling amusing stories made him very popular. Many a young woman had her eye on him—but they wondered if he would be willing to settle down. Soon, Davy was attracted to the young niece of his employer. He found to his dismay, however, that she had promised to marry someone else. S CHOOLIN ’ AND COURTIN ’ to them that he wasn’t to be taken seriously. Or maybe they realized he probably wouldn’t be content to stay in one place very long. “My heart was bruised, and my spirits were broken down,” Davy wrote of his second romantic breakup. So I bid her farewell, and turned my lonesome and miserable steps back again homeward, concluding that I was only born for hardships, misery, and disappointment. I now began to think that, in making me, it was entirely forgotten to make my mate, that I was born odd, and should always remain so, and nobody would have me. . . . I had no peace day nor night for several weeks. My appetite failed me, and I grew daily worse and worse. They all thought I was sick; and so I was. And it was the worst kind of sickness—a sickness of the heart, and all the tender parts, produced by disappointed love. Then in 1806 he met Polly (Mary) Finley. He fell in love with her at a “reaping,” an old-fashioned community dance party. Davy was pleased with her from the start. They danced and talked for a long time that night. This time, the tables were turned in Davy’s favor. Polly broke up with another young man in order to marry Davy. In a matter of weeks, their wedding was arranged. credit from the general store. The next year, their first child was born; they named him John Wesley Crockett. Another son, William, and then a daughter, Margaret, came in 1809 and 1812. By then, the family had moved west of the Appalachian Mountains, settling in southern Tennessee. The country was rich in game. Davy wrote: “It was here that I began to distinguish myself as a hunter.” Plenty of deer, rabbits, and other small game were in the woods, and Davy put his long rifle—with which he reportedly could hit targets several hundred yards away—to good use. He found to his dismay, however, that the bears had been hunted almost to extinction in that area. Soon, Davy’s rifle would be aimed at human targets. Not far to the south, Creek Indians were on the brink of warfare against the white settlers. S CHOOLIN ’ AND COURTIN ’ Davy lived during the early days of America’s westward expansion. Pioneer families were willing to settle in the wilderness, where they could work farmland of their own. As more and more of them moved west in Conestoga wagons and river flatboats, conflicts with the Native Americans seemed unavoidable. Many Americans believed the Indians should be forced to give up their territories. Although some Indians agreed to do this, others resisted, and tragedy resulted. Settlers called the rebellious Creek Indians “Red Sticks,” either because of their red-painted battle clubs or the red poles they put up in their villages. In 1813, Creek warriors went on a rampage south of the Crocketts’ Elk River country. The unrest occurred in what today is Alabama. White Americans on the frontier feared the Indians were being armed by Spanish and English enemies in the Southeast. White volunteers and Creek war parties began to set up ambushes and carry out surprise attacks against each other. When a Red Stick war party overran Fort Mims in Alabama and massacred more than 500 settlers, the whites organized a militia. General Andrew Jackson was in command. The region was at war. Like Davy Crockett, Andrew Jackson lived on the frontier in Tennessee. During the War of 1812, Jackson was the most successful American general, defeating the Creeks at Horseshoe Bend and driving the British from Pensacola, Florida. D AVY C ROCKETT anything but amusing. In November, he was part of a force of 500 volunteers who crept up on a Creek village at a place called Tallusahatchee. Eager for revenge after the Fort Mims massacre, they attacked in a fury. More than 40 warriors were burned to death inside a hut. Men and women alike were slain. In all, some 200 Creek died that day—and memories of the bloodshed haunted Davy for many years. Davy earned about $65 for serving three months with the army. That would be a small sum in today’s workforce, but in 1813 it was an enormous amount. Polly was pleased with his earnings, but she was more pleased to have him home again just in time for Christmas. She was not at all happy when he reenlisted the very next year. This time he would be gone six months, and he would be fighting a different enemy: the British. Barely 30 years after winning its long war for independence, the United States was engaged in another struggle against the English redcoats. The War of 1812 was in its third year. In September 1814, Davy went to the far western region of Florida (sometimes called the Panhandle) as a sergeant with a unit called the Tennessee Mounted Gunmen. The Battle of New Orleans, fought January 8, 1815, was one of the few American victories on land during the War of 1812. British casualties were more than 2,000 men; just 21 Americans were killed or wounded. The battle made Andrew Jackson a popular hero. industrious woman, and owned a snug little farm, and lived quite comfortable,” Davy said. Elizabeth was a wise businesswoman as well as a loving wife and mother. Her “snug little farm” was no less than 200 acres. Elizabeth and her former husband had been quite prosperous, amassing a fortune of some $800 in cash. Davy had not only acquired a wonderful mate; he suddenly had become a prosperous farmer. Davy wrote his autobiography in 1834. Considering his reputation as a sturdy, daring, unconquerable frontiersman, his descriptions of failures are surprising to read. While his book includes exaggerated portrayals of himself as a hero, it also reports his episodes of getting lost, falling sick, being afraid and rejected, and failing to accomplish things he set out to do. F IGHTING R ED S TICKS AND R EDCOATS called Shoal Creek. The log cabin community grew rapidly. The couple built a gristmill and did a brisk business grinding corn into meal for their neighbors. They also set up a whiskey distillery and a gunpowder factory. Besides his duties as magistrate, Davy was appointed justice of the peace. This meant he now could perform marriages and handle taxes, as well as administer justice to common criminals. Then, the local militia elected him their colonel. This was undoubtedly his proudest achievement up to that point in his life. But this was only the beginning. Davy was respected for his fair sentencing and was loved for his sense of humor. No one was surprised when the homespun woodsman’s spiraling popularity soon led him into politics. let Davy speak first, confident the frontiersman’s ignorance would be obvious to the people. Surprisingly, that approach worked in Davy’s favor. At the rallies, by the time his opponent’s turn to speak came, the audience had dissolved, following Davy to the bar. His opponent had no one left to listen to him, while the crowd was spellbound by Davy’s funny stories. Davy won the election by a landslide and was off to Murfreesboro, then the state capital. B ACKWOODS P OLITICIAN didate.” But a week later, a local newspaper reported that Davy would run for office again. Apparently, the newspaper article was a practical joke played on him by some of his friends. However, it served to renew Davy’s desire for “electioneering.” This time, he campaigned against an influential doctor in the area. Again, his down-toearth popularity got him elected. One thing that made Davy so well liked was that he knew little more about the workings of government than the uneducated farmers and traders who elected him. His ignorance actually worked to his advantage. The voters felt he truly was one of them. In his book, he described one of the first conversations he had with some of his fellow legislators. They were discussing the appointments of judges— the judiciary branch of government. Davy hastily excused himself and left. “I was afraid some one would ask me what the judiciary was; and if I knowed I wish I may be shot. I don’t indeed believe I had ever before heard that there was any such thing in all nature.” Another story from his autobiography recalled a campaign stop in an unfamiliar neck of the woods. B ACKWOODS P OLITICIAN and at the end of it cotton was down . . . again; and I concluded I would try him once more, and see how it would go with cotton at the common price.” But first, Davy wanted a recess from politics. While waiting for the next election, he devoted the next two years to his first loves: hunting and trying new wilderness ventures. By the end of Crockett’s time in Congress, his exploits had become legendary. Beginning in 1836, a number of publishers brought out almanacs bearing his name. In addition to weather information and farming tips, these almanacs included fanciful stories about Crockett’s adventures. This cover from an 1847 almanac shows him wrestling with a wildcat in a tree. D AVY C ROCKETT plan was to transport a large shipment of these wooden staves down the Mississippi River to New Orleans, where Davy expected to earn a handsome profit. The project would take months. But despite his log-cutting and carpentry he still made time to hunt game. And his favorite prey was bear. He reported killing 15 of the fierce (but awkwardly fat) animals in a two-week period—on the average, a bear a day. One day, he wrote, he and his young son, with a pack of fine hunting dogs, took three bears in half an hour. The episode began when their dogs picked up a scent and went charging out of sight through a canebrake. As Davy stood listening, he realized his dogs had split into two groups, and both were fighting. He sent his young son after one group of dogs, while he ran after the other. He found the dogs had a twoyear-old bear down on the ground; without even firing his gun, Davy snatched out his butcher knife and thrust it into the bear. A few moments later, he heard a gunshot; his son had also killed a bear. While they were exchanging stories, they heard a dog begin to bark, and the other dogs took off. Davy and his son followed and found the biggest bear of all up in a tree. They shot and killed that bear as well. F ROM C ALAMITY TO CONGRESS This watercolor painting of Davy Crockett was made when he was serving as a congressman in Washington, D.C.
D AVY C ROCKETT As Crockett became more openly opposed to the leadership of Jackson and his vice president, Martin Van Buren, the two men made it harder for Davy to accomplish anything in Congress. Some people thought Crockett might challenge Van Buren for the presidency in the 1836 election. F ROM C ALAMITY TO CONGRESS play in Washington—and exchanged public bows with the actor who portrayed him. He went on a speaking tour throughout the Northeast and was greeted enthusiastically at every stop. People were eager to listen to the frontier politician whose astonishing deeds—whether true or exaggerated—were being publicized far and wide. His national popularity made him a hero for all time, but it did not ensure his political future. In 1835, his career as a statesman reached its climax. Davy Crockett, now almost 50 years old, was at the crossroads of his life. Crockett is depicted here at the center of the Texas soldiers, defending the Alamo’s southeast wall in the final rush of Santa Anna’s overwhelming military force. The 1,800-man Mexican army outnumbered the Texans 10 to 1 when they attacked at dawn on March 6, 1836. When Davy Crockett arrived in Texas, the area was part of Mexico. At the time, Mexico was ruled by General Antonio López de Santa Anna, who had established a dictatorship. Santa Anna was a skilled military strategist. Jim Bowie was a 40-yearold adventurer, whose claim to fame was the creation of a large hunting knife popularly called the bowie knife. Bowie seemed to welcome a last stand at the Alamo. “We will rather die in these ditches than give it up to the enemy,” he wrote. D AVY C ROCKETT America’s most famous backwoodsmen would join company in the epic battle. Sam Houston, commander of all the Texan forces, ordered Travis to abandon the Alamo. Houston knew the complex could not be defended for long against such a large Mexican army. But Travis refused to move. “Victory or death!” he vowed defiantly. The blue and white uniforms of the Mexican Army came into view on February 23, 1836. If the Texans did not surrender, Santa Anna warned, they would be given “no quarter” but would be killed to the last man. The Texans stood firm. Santa Anna ordered a bombardment, then massive attacks. One wave of Mexicans was beaten back with heavy losses, then another. T EXAS the subject of movies, television serials, plays, and songs. But serious students of frontier history remember Davy by a different slogan—the one he lived by. Whenever you’re facing a tough decision, he advised, “be always sure you’re right—then go ahead!” Throughout his life, he applied the motto in all types of situations: courting, hunting, exploring, “electioneering,” and joining the Texans in their bloody fight against Santa Anna. He had many faults—bragging, leaving his wife and family for long periods to explore new lands, improving his personal image on tour while neglecting congressional business, perhaps enjoying himself a bit too much over whiskey with his friends. But he always stood fast for the important issues he believed were right. The story of Davy Crockett is one of ups and downs, triumphs and tragedies. He endured severe illnesses and family tragedies, lost his possessions more than once, left politics in final defeat, and lost his life in battle. To the end, though, he kept his sense of humor and his belief that he could bounce back from any calamity—by honest means. He lives in history as possibly America’s best-loved and most-respected pioneer. G LOSSARY agenda—a planned political program; a list of things to be accomplished. buckskin—animal hides, often used to make clothes. Conestoga wagon—a horse- or mule-drawn covered wagon used by pioneers to carry their belongings westward. distillery—a factory where liquor is extracted from solid produce. economic—having to do with money matters. extinction—the elimination of (usually) a species of wildlife, altogether or from a certain habitat it once occupied. faction—a party or group within the government. flatboats—flat-bottomed, usually rectangular work boats used to transport freight along rivers and other shallow waters. grassroots—having to do with the basic, most fundamental level of society, the common people. gristmill—a mill, usually powered by water-driven wheels, where corn and other grains are ground into meal, flour, and other food products. militia—a local or regional military force called to duty only in times of emergency, as distinguished from the army of full-time “regular” soldiers. staves—narrow strips of wood used to construct the sides of containers such as barrels. wagoner—a person who transported products in frontier times, using a crude, sturdy, horse- or mule-drawn wagon. F URTHER R EADING Blair, Walter. Davy Crockett: Legendary Frontier Hero. Springfield, Ill.: Lincoln-Herndon, 1986. Burke, James Wakefield. David Crockett: The Man Behind the Myth. Austin, Tex. : Eakin, 1984. Crockett, David. The Life of David Crockett, The Original Humorist and Irrepressible Backwoodsman: An Autobiography [reprint]. New York: A.L. Burt Company, 1902. Derr, Mark. The Frontiersman: The Real Life and the Many Legends of Davy Crockett. New York: William Morrow and Company, 1993. Lofaro, Michael A., ed. Davy Crockett: The Man, the Legend, the Legacy, 1786-1986. Knoxville: University of Tennessee Press, 1985. Moseley, Elizabeth R. Davy Crockett: Hero of the Wild Frontier. New York: Chelsea, 1991. Sanford, William R., and Carl R. Green. Davy Crockett: Defender of the Alamo. Springfield, N.J.: Enslow, 1996. Shackford, James Atkins. David Crockett: The Man and the Legend. Chapel Hill: University of North Carolina Press, 1986. DANIEL E. HARMON is associate editor of Sandlapper: The Magazine of South Carolina and editor of The Lawyer’s PC, a national computer newsletter. He is the author of 26 books, most of them nonfiction historical and humorous works and biographies. Harmon lives in Spartanburg, South Carolina. Report "Davy Crockett (Famous Figures of the American Frontier)"